Purpose: Remote Buddhist monastery located in the Rocky Mountains of southwestern Colorado needed a potable groundwater resource, servicing more than 100 staff, volunteers, and visitors during the height of their retreat season. Objective: Provide subsurface imaging of the geologic structures (e.g., faults) in order to recommend a single well location that: 1) could generate at least 30 GPM of potable water, and 2) is within 400 feet of the ground surface. 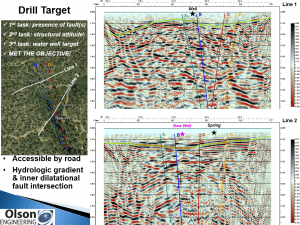 Method: Two seismic reflection lines, each ~950 feet long, oriented to traverse regional extensional features (i.e., normal faults) and interpret their structural attitude. Extensional structures were targeted for this project because regionally these geologic features are most likely to have antithetic features (i.e., fracture zones) which yield groundwater due to secondary porosity. 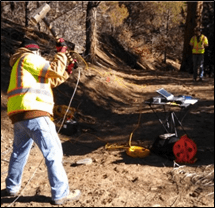 Data Acquisition: A four-man seismic crew with 16-pound hammer source performed the reflection survey in rugged, mountainous, forested terrain over the course of two days. Interpretation: Seismic reflection amplitude/time sections indicated four steeply-dipping normal faults, which form a small ‘graben-within-graben’ structure. 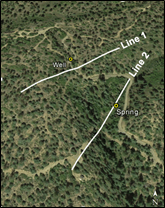 The position for a new well was selected based on access, hydrologic gradient, and anticipated intersections with fracture zones within inner graben (i.e., associated with Fault B). Result: A well was drilled in early 2014. It encountered an artesian potable water resource flowing at ~75 GPM in a fracture zone about 190 feet below the ground surface! This well continues to supply Tara Mandala with ample water under artesian pressure.